The latest in Bridget Williams Books mini publications of short books on big topics focuses on the social justice of climate change. 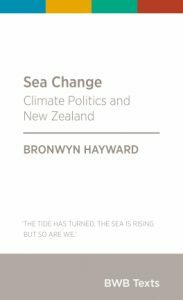 I picked up Sea Change: Climate Politics and New Zealand on a Friday evening thinking I’d skim through the intro to get a taste of what University of Canterbury’s Dr Bronwyn Hayward had offered in her 90-page BWB Text. Two hours later I was closing in on chapter four and the daylight had faded until I could no longer read without wrenching myself off the couch to turn a light on. If you haven’t come across Dr Hayward before, she’s a political scientist, the only New Zealand lead author on the IPCC special report on the impacts of global warming of 1.5°C, and a regular media commentator (who, it must be said, brought calm, level-headed commentary to what was at times a chaotic election season). It was also an election season that saw one party leader asserting that people don’t get out of bed in the morning thinking about climate change (speak for yourself, Bill), while another called it her generation’s “nuclear-free moment”. That dichotomy cuts to the crux of Sea Change: we can’t wait for our leaders to agree on action, there needs to be action at the individual and community level. Where much of our climate change commentary has focused on the physical aspects, or certain parts of policy, Sea Change takes a social and environmental justice approach to climate change that makes for a refreshing take on the issues; one that makes you sit up and reassess the lens you’ve been viewing the topic. A key point that Hayward makes is that when it comes to climate change, we’re not all in this together. The biggest emitters are not those who live on low-lying Pacific islands or flood-prone rural towns. Māori will be particularly affected by a warming climate but also bear the brunt of colonisation that concentrates decision-making power in the hands of those who have benefited from colonialism. These aren’t ideas we’ve heard from our recent Governments; even the Green Party, Hayward points out, has struggled to draw a link between inequality and the repercussions of climate change. We are bombarded with rhetoric about a thriving economy and the primary industries as our country’s backbone, but do we, as Hayward says, “challenge the idea that all growth is good growth”? And while I chewed through those first four chapters quickly, the places Hayward took her narrative from there slowed me down: her descriptions of models of citizenship and “deliberative democracy” – that is, decision-making through listening and reflecting, rather than simply canvassing the public’s views through referenda or elections. Living very solidly in a science work environment, these aren’t conversations I hear often. They made me stop, think, go back and re-read. They made me feel empowered, in the sense of having someone shine a light in a dark corner and show you what you haven’t seen. And they reminded me of the power of the people, the power to change the tide. BWB Texts, November 2017, RRP $14.99. Featured image: Flood-prone properties in Popua Village, Tonga. Flickr CC, Asian Development Bank.